Our second stay at this property and are planning a third. We had a wonderful time because of how peaceful and relaxing and perfect everything was. We celebrated our 10th Anniversary. We mostly stayed at the cabin, but did take a drive up the blue ridge parkway for a lunch picnic overlooking the mountains. Can't wait to go back! We had a wonderful visit! Everything was clean, comfortable and accessible! I would highly recommend this cabin to my friends and will request this one on my next visit. We loved it here!. This was exactly what we needed! Good quality time with our family. We enjoyed the slow pace and relaxed here in this beautiful cabin. The peace and quiet was most definitely perfect! We noticed the lady bugs and painted one on a rock to leave behind for all to enjoy. We are part of a Face Book page, St. Augustine rocks, where we paint rocks and hide them for everyone to discover. Its our way of spreading love and happiness. We will be back! This was a great little getaway. The cabin was very nice and I enjoyed the privacy! It was very well maintained, we loved having a full kitchen and plenty of room. It was a great cabin and a great value. Everyone was really nice and helpful! This cabin is totally awesome, so beautiful! The view is amazing. We called during our stay and booked another night because we didn't want to leave! We love the fireplace, hot tub and spacious rooms. Everything was perfect! We can't wait to come back to this beautiful place! WWE love this cabin! We loved the cabin and all the amenities - the view was perfect and we would definitely stay here again. What an amazing adventure. This is an amaing place to stay, perfect for my birthday! the Christmas tree was a an extra special touch. Thank you! This was such a beautiful place very spiritual and comforting. I plan on coming back again. I was very satisfied and at peace. My stay at this cabin was more than I could ever imagine. I did not want to leave. It's very cozy and peaceful. I am very grateful for all this cabin has. Came to the cabin on the mountain seeking answers to questions that we had. Felt the spirit of the most high and the healing of this place. The cabin is beautiful with very comfortable beds. We loved the fireplace! This place was great. It had an amazing view and the Hot Tub was wonderful. Thank you for letting us stay here. My parents brought me here and I love the view and the mountain and the fire pit. Me and my sisters loved it! This has been an amazing and much needed break from reality. The views were amazing and ever-changing. This cabin is spectacular! We enjoyed the mountain biking trails and just kicking back in front of the fireplace watching a movie or playing a game. We really enjoyed our stay. The cabin is great. We had incredible weather the entire week. The sunsets were beautiful. The full moons were awesome. Dinner at Pasqualinos in Bryson City was excellent. 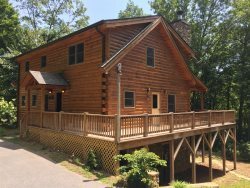 We love this cabin because it is easy to do a lot of day trips - Great location. This is such a beautiful area. Thanks for such a great cabin! We really enjoyed our stay at Shooting Star. This cabin is great! We had incredible weather the entire week. The sunsets were beautiful. The full moon was awesome. Dinner at Pasqualinos in Bryson City was excellent. We love this area because it is so easy to do a lot of day trips and is so beautiful. This cabin is in a great location. Thanks for such a great cabin stay! Kathy and Kelly were extremely helpful and friendly. It's hard to find those qualities nowadays. This is by far the best cabin we have stayed at to date. The view and peacefulness was awesome! If you are looking to fet away from it all this is the place to go. We saw plenty of hummingbirds at the feeder! Just absolutely beautiful. Thank you for everything. We will be back! Whenever I callled or emailed the staff I received a response in less than 30 minutes. They were incredibly helpful and attentive. The best Vacation ever!! Thank you. Everything was awesome. The cabin is beautiful and very relaxing!